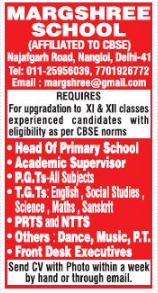 Margshree School, New Delhi has advertised in THE HINDUSTAN TIMES newspaper for recruitment of Teachers PGT / TGT / PRT / NTT / PT jobs vacancies. Interested and eligible job aspirants are requested to apply within 07 days from 15th January 2019. Check out further more details below. About School: The best path to Goddess Saraswati, fulfills the long felt need for quality education in West Delhi. The School is run by Mahendra – Krishna Education Society, which has many committed educationists as its members. It is an English medium, co-educational day school, offering education from nursery to Class XII and follows the CBSE curriculum. How to Apply: Interested and eligible candidates are requested to send their application along with CV, copies of certificates, PAN card, Aadhaar card and recent passport size photo to the email address given below or apply by hand.